Well, 20,000 feet of snow couldn't stop Wine Club. The ever handsome Richard Fisher hosted and provided lovely snacks for our tasting of New York State Wines. Our random wine picking yielded 2 rieslings, 2 chardonnays, 1 cabernet sauvignon, and 3 merlots - and I think the group consensus was that the Rieslings were the most interesting and tasty. The merlots were pleasant, like merlots like to be. The chardonnays were liked by everyone, except me. Maybe it was the cold medicine, but I had a really hard time getting into them. One of them I reviewed as "Is this really chardonnay? It's like sour apples." The other one I also found tart as well, but I couldn't smell anything distinctive (could be my stuffy nose) and it vanished from my mouth as soon as it was swallowed. None of that oaky, buttery california stuff here. Interesting. Maybe I'll re-try these when I am not high on drugs. So, here are the three favorites from Wine Club #8. "Very enjoyable, on the sweet side with a little peppery taste"
"Pleasantly tart for a Riesling"
"My favorite - I could drink this all night"
"Is it me, or is there no nose? No finish? "Crisp and light, like a Hugh Grant movie"
"A bouquet like a delicate marshmallow"
"My fave of the reds"
I always thought Rieslings were underrated. 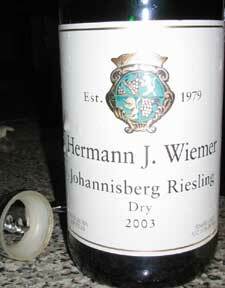 Although, bad Rieslings can be very, very bad. As in, bad enough that even I won't drink it. I will have to give the Herman J. Wiemer a try. who are you kidding . . .of course you'd drink it . . .
Rieslings and indian food are totally yum. Klutch is right. I'd drink antifreeze if they called it "Johnnio Walker Blue-Green". and by "Johnnio" i mean "Johnnie". you and rach should head up to the finger lake wine trail. it's so fun. but get someone to drive you around - you'll quickly get wasted on all those sips! I think the chardonnay was actually a Finger Lakes wine, too, not Long Island. Mmmmm, that cheese Richard had, totally addictive, funky dry gouda. Where did ya get it??! I appreciate you trying to keep my wife off the sauce by not inviting us. I did tell your wife beforehand that I was having a wine club and I assumed that she would be giving birth and wouldn't want to climb up to Richard's 4th floor apartment like she had done two nights before. you had a baby yet?